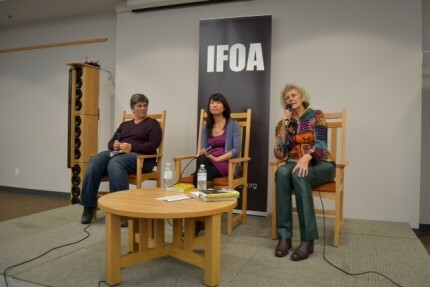 Still mulling over a remark about great writers being egomaniacs at the IOFA Ontario discussion I was a part of on Thursday Nov 3 in Midland. 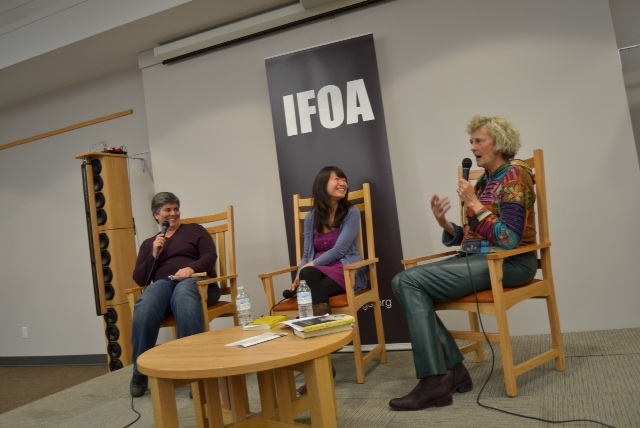 Authors Madelaine Thien and Helen Humphreys discussed their recent novels Dogs at the Perimeter and The Reinvention of Love. Respectively. I’m still thinking about Helen’s claim that great talent often means great ego and a disregard for others. It’s not that a big ego and a big talent come as a package but maybe the big ego and disregard for others helps put the artistic talent forward the way sociopaths are often able to run companies well. Helen wrote about Victor Hugo and his wife Adele who had an affair with Hugo’s friend. In Helen’s portrait, based on a lot of historical research, Hugo was an egomaniac. Both novels dealt with secret lives. Thien’s novel is set in Cambodia, Vietnam and Canada and she enthralled the audience with her description of how the Khymer Rouge used to make their prisoners write their biographies over and over again and then they arrested the people mentioned in the biographies.